In order to further implement the “financial support to small micro enterprise development of the implementation opinions” (NO. 87  issued by the general office of the state council),“the state council on support the healthy development of small micro enterprises”(NO.52 ), expend service channel for small and medium enterprises, especially the small and micro enterprises, agriculture, countryside and farmer, to promote innovation of financial products, set up a nationwide docking trading platform for banks and small and medium-sized enterprises, open up business resources, the eighth 2016 International Investment & Finance Exhibition of China sponsored by the Investment Association of China, together with several media, will be grandly convened at National Agriculture Exhibition Center, Beijing in Nov. 5， 2016, and all major banks, private equity fund institutions, trust institutions, loan guarantee institutions, and third-party financial service organizations will be invited to the exhibition. The exhibition area is to exceed 10,000square meter. The organizing committee will hold a grand opening ceremony, on which a series of splendid theme activities such as China investment & wealth management forum, financial masters forum, wealth management forum, capital citizens wealth management month, etc. will be presented. This exhibition will play a significant role in promoting the financial cooperation among regions and the international development of the capital’s finance, building the platform for high-end exchanges between Chinese and foreign finance industries, establishing the platform for supporting the finance and real economy, and constructing the platform connecting financial institutions and enterprises as well as the public. The organization has specially invited powerful enterprises to be the sponsors of the conference; the sponsors will enjoy all the special treatment provided by the conference. 9.The booth area of 50 square meters for free. Last year, our exhibition attracted more than 220 institutions and enterprises, whose fields covered finance, fund, wealth management, investment, and industry. There were more than 10,000 professional visitors who had attended the exhibition, and the turnover of all the contracts signed during the exhibition had reached 1.2 billion RMB. The top officials of National Development and Reform Commission, the Investment Association of China, and other departments who attended the exhibition of last year will also participate in the exhibition of this year. The organizing committee has a VIP database of the finance departments of 20 banks, and a finance information database of 2.2 million people. In those databases, the total finance amount has reached 15 billion. The professional finance audience who will be present at the exhibition is predicted to be around 35,000. There are more than 800 people from over 30 chambers of commerce invited by the Investment Association of China to participate in and focus on this exhibition, and those chambers of commerce include Wenzhou Chamber of Commerce, Zheshang Chamber of Commerce, Jinshang Chamber of Commerce, and so on. Nationwide, 30,000 free tickets and 50,000 half-priced tickets will be given away; 30,000 invitation letters will be directly delivered; 100,000 leaflets will be sent to the similar exhibitions. The professional investors in the level of 1 million- 10 million are predicted to be around 15,000. This exhibition is authorized by State Administration for Industry & Commerce of the People’s Republic of China, guided by National Development and Reform Commission, and will jointly hosted by the Investment Association of China and authoritative media. The Finance Managers Club jointly established by CHINA BANKING ASSOCIATION and the Investment Association of China has had more than 500 members, the quantity of which is predicted to be 1,500 in 2 years. Every manager has near 100 finance clients, and he will exert that resource advantage hard during the exhibition. Meanwhile, the excellent finance managers of 2016 will be selected. 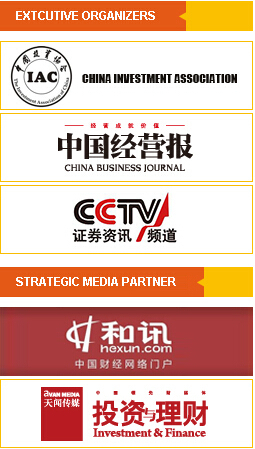 Trusted by National Development and Reform Commission and the Investment Association of China, the first 30 excellent finance institutions will be selected, whose names will go to the enterprise name book, waiting for being observed, and the self regulations for investment and finance industry which will be a base for the management policy of investment and finance institutions will be consulted to be established. ·500 USD/ ㎡ for overseas companies, and the payment in dollar is allowed. 5.The organizing committee sends confirmation letters. Finance Media and Finance Tools, etc. Overseas Investment Investment Immigrantion, Real Estate Investment, Foreign Exchange Investment.